Real Estate: Consists of a .23+/- acre lot with 58+/- ft. of frontage on Main St. The lot is improved with an 11,000+/-SF, 2.5-story wood framed building. 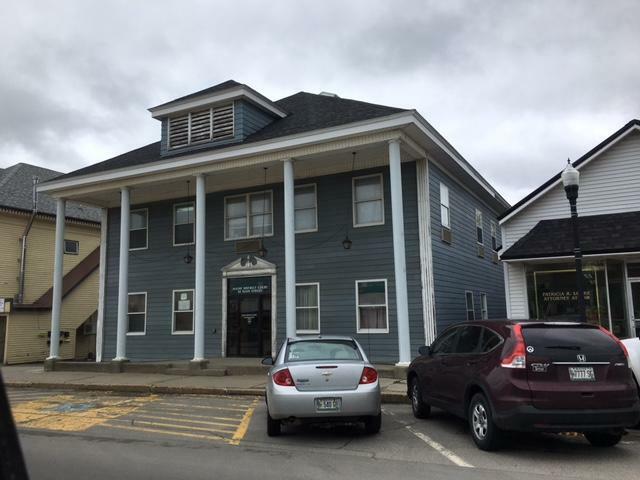 The first level is currently rented to The State of Maine District Court. A wellness center rents an office on the upper level. There are multiple offices that could be rented individually or as a whole. Reference Lincoln Tax Map 137, Lot 51. Preview: Monday, Nov 27, 2017 a caravan of all the Lincoln properties starts at 11:30AM From 458 Main St. Directions: From Main Street in Downtown Lincoln, follow Rt. 2 north to the property on the left. Terms: A $10,000 deposit (nonrefundable as to highest bidder) in CASH or CERTIFIED U.S. FUNDS, made payable to the Keenan Auction Co., Inc. (deposited with the Auctioneer as a qualification to bid), increased to 10% of the purchase price within 5 calendar days of the sale, with balance due and payable within 30 days from date of auction. The property will be sold by public auction subject to all outstanding municipal assessments. Conveyance of the property will be by release deed. All other terms will be announced at the public sale. For a Property Information Package visit KeenanAuction.com or call (207) 885-5100 and request by auction number 17-246. Richard J. Keenan #236. Our 45th Year and 7,713th Auction.